The Gulf of Carpentaria in Australia's remote north is one of the last remaining safe havens for endangered marine species including 6 of the world’s 7 marine turtle species, dugongs and sawfish. It is a sparsely populated region yet receives significant marine litter, mostly comprising thousands of derelict fishing nets (ghost nets) that wash up on shore each year. These nets vary in size from a football to a Mack truck (6 tonnes or 6 kilometres long). Sea turtles make up 80% of the marine life found entangled in these nets and many of these are dead or dying. In the last 10 years more than 300 entangled turtles have been removed from 13,000 ghost nets. Recent estimates suggest this is just the tip of the iceberg. The estimated number of turtles caught by a sample of 8690 ghost nets was between 4,866 and 14,600 turtles, assuming nets drift for 1 year (Wilcox et al., 2014). Net identification work indicates that less than 10% of these nets are coming from Australian fisheries. The question was where do the other 90% come from and how can it be stopped? What was needed was a solution to the ghost net problem; a way to identify the source of the ghost nets and an approach to ameliorating their impacts. What was needed was a solution to the ghost net problem; a way to identify the source of the ghost nets and an approach to ameliorating their impacts. Since 2004, GhostNets Australia (GNA) has been involved in the development of an innovative approach to address and manage this ecological threat; a threat which is particularly challenging because it encompasses a broad geographic and isolated region with a wide array of local and regional impacts. GNA adopted a multipronged approach. The initial management response was at a local level to build the capacity of 31 coastal indigenous communities who wanted to clear nets from beaches as part of their customary responsibilities for looking after ‘country’, and in doing so, protect over 3,000 kilometres of saltwater country from ghost nets. Support included providing a ‘fee for service’ arrangement (2004-2013) which ensured indigenous rangers were adequately funded for their ghost net work. GNA also provided training in data collection, ghost net identification and safe work practice as well as supplying much needed resources such as vehicles, net cutters and extra manpower. The collected nets have been recycled into artwork and merchandise, providing communities with a much needed alternative income. Ghost net art has also proven to be a great vehicle for alerting the public to the damage that ghost nets inflict on the marine environment. Since 2012, GNA has expanded its management response beyond the coastline, in a bid to work towards a vision of an ocean free from ghost nets. Analysis of the ranger collected data by the Commonwealth Scientific and Industrial Research Organisation (CSIRO) has revealed that most of the nets originate from the Arafura Sea to the north of Australia. This is an area where many fisheries are unregulated making it difficult to understand exactly who is fishing in the region. 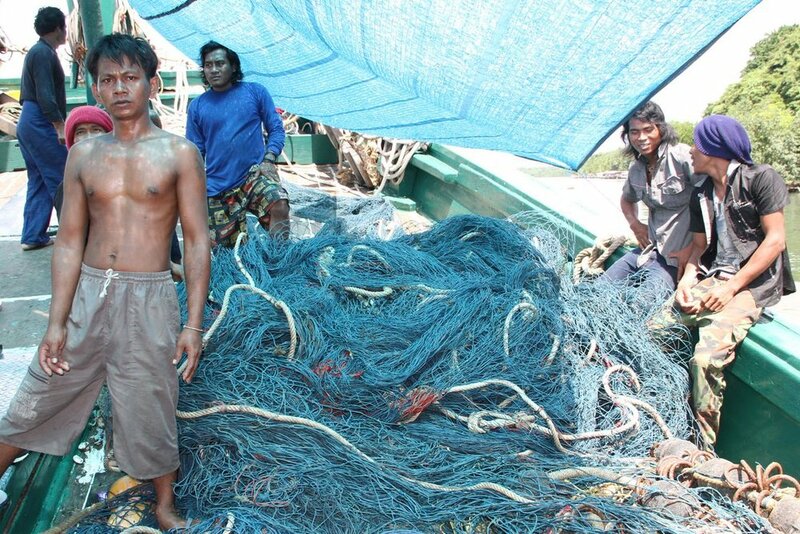 With the source of the nets identified GNA was able to run a series of workshops with fishers that legally operate in the Arafura Sea to understand the causes of ghost nets in the region. Overcapacity of the fishery stemming from an overwhelming illegal fishing effort was highlighted as the prime driver for nets to become lost and damaged at sea. GNA is now working with the Indonesian and Timor L’este governments, fishing industries and others to implement management measures that will strengthen the sustainability of fisheries in the region while also reducing ghost nets. Since 2004 more than 13,000 pieces of net have been measured and recorded in the GNA database creating a comprehensive overview of the amounts and types of ghost nets impacting north Australia. The desire to protect the environment has provided an opportunity for communities and natural resource management agencies to develop partnerships to reduce ghost net impacts on marine fauna. The analysis of the data collected has provided clear information with respect to where the nets come from (including which fisheries), how they arrive and their impact on marine wildlife such as sea turtles. This has opened doors to partnerships with transboundary governments, industry and NGO stakeholders committed to addressing the issues and improving the sustainability and livelihoods of fishers in the Arafura Sea. GNA is now establishing a fisheries extension programme across the region that will work to strengthen the sustainability and livelihoods of fishers in the region while also reducing the discarding of nets. Indigenous rangers in north Australia will play a key role going forward in monitoring the outcomes of these efforts by way of net reductions. Establishing a strong culture of consistent data collection at the grassroots level has been key. Building effective partnerships with the CSIRO and the Arafura and Timor Sea Ecosystem Action Program (ATSEA) has enabled the data to provide the answers to very complex questions. Being realistic and acknowledging that the prevention of ghost nets will result in trade-offs in benefits for the livelihoods of fishing stakeholders and rangers alike has reinforced the need for practical solutions.